I have a knack for complicating situations all around me, so in the end, there is nothing I crave more than simplicity. 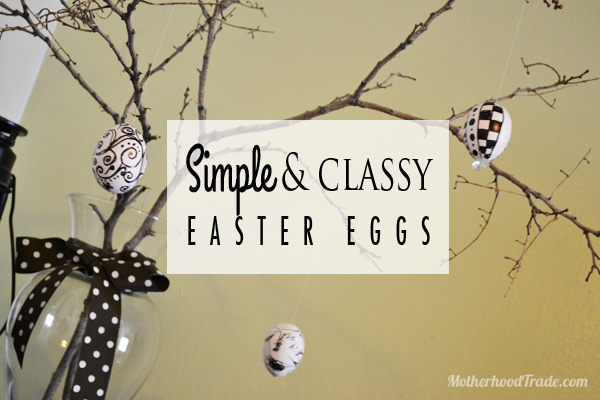 This is the branch where I hang simple adornments to add a touch of the season into my living room. For Valentine’s Day, I hung these ridiculously simple hearts, and for Easter, I made these stylized hanging eggs. 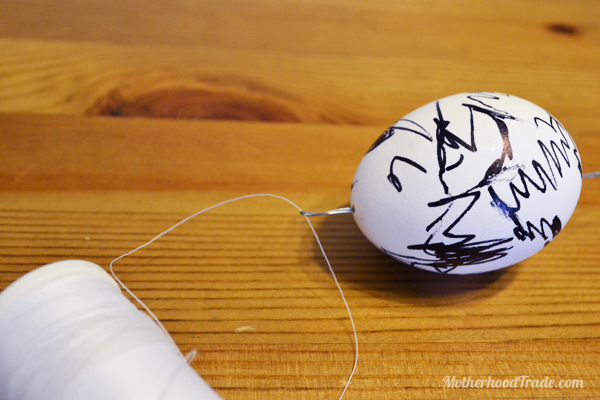 All you need is an egg, a pin, a toothpick and a sharpie. To hang them, you will need string and a long sewing needle. Or you could follow my example and use some wire from a broccoli twist-tie in the fridge (resourceful, eh? Ok… Maybe just cheap.). Prior to blowing out the egg, wash it. 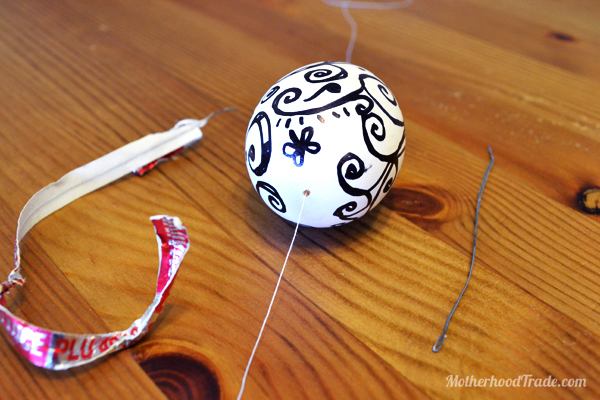 Next, poke two minuscule holes on either side of the egg with a push pin. Do it slowly and carefully! Twist the pin around to make sure it is a nice, clean hole. Grab your toothpick (or a bent paper clip, which may work better because it’s a bit thinner), and twist it into the hole. Scramble the inside of the egg by carefully moving your toothpick around without cracking the egg. Pull out the toothpick and blow out the egg guts by putting your lips against the egg (this is why we wash…). Blow on one side so it will spew out on the other (grab a bowl!). You can also use one of those baby nose syringes if this concept grosses you out. Decorate as you wish with a sharpie marker. I let my kid scribble on one. They are REALLY fragile, so hold onto it with very little pressure. Thread with a makeshift needle or just use a big sewing needle. Once threaded, tie a bead or bend the soft twist-tie wire into a circle and tie that at the end. 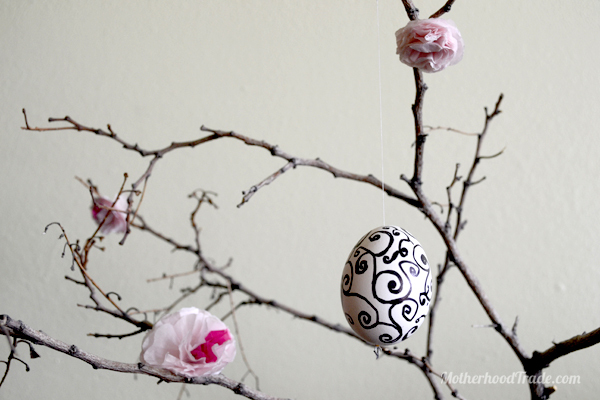 Here is another simple spring idea for your ‘branch’: add small tissue paper flowers. Enjoy spring and Easter!!!! So excited for warm weather fun! ← My obsession with ‘getting things done’ and how it blocked real happiness.